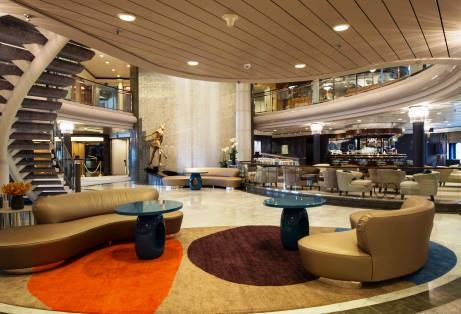 Award-winning Crystal Symphony has emerged from a two-week, $20 million-plus dry dock redesign with lushly reimagined spaces, indoors and out. Fitness spaces - A brand new outdoor Fitness Garden was added to decks 7, 8 and 12 aft. Deck 12's indoor plus the Fitness Centre boasts all new equipment. Crystal Plaza - The main lobby area (including the Reception, Front Desk, and Concierge sections), and the bustling "hub" on board, boasts added drama with a new towering waterfall, a rich colour palette of indigo and bronze, bespoke carpets, new upholstery and tables for fresh flowers complementing the existing marble floors and wood balustrade and stair details. Stateroom upgrades - 48 newly converted PURE hypoallergenic luxury staterooms are now available on the ship, offering a comprehensive, chemical- and odour-free indoor environment solution. Spa and Salon - Colourful new tiles adorn the steam room and changing areas in the men's and women's spa facilities, while the salon has been upgraded with a new pedicure area and wall coverings. Casino - The port side wall was removed to create a more open, accessible space, showcasing a modified layout, and new slot machines. 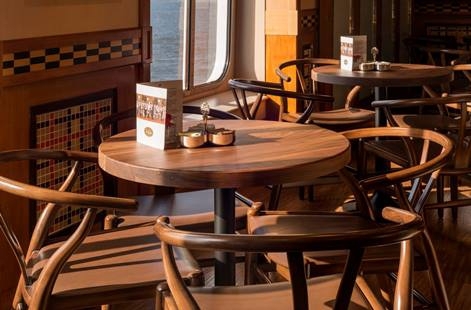 The Bistro - New seating and décor reflects a European bistro in a modern way, bringing fresh life to one of the most popular meeting and dining spots on the ship. Tech upgrades - New digital signage will display important cruise and programming details throughout the ship on 14 flat screen monitors near the ship's lounges, theatres, dining and sales areas. Indoor & outdoor refreshments - Deck 10 staterooms and Penthouses now sport new verandah furniture, while carpets for all deluxe staterooms (415 in all), as well as guest corridors on four decks, were replaced. "We continue to invest in creating a contemporary and sumptuous environment that meets the travellers' desire," says Crystal President and COO, Edie Rodriguez. 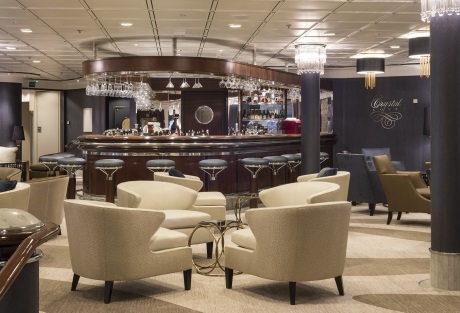 "The new features and spaces added during this dry dock are astounding, and offer our guests the relaxed, yet luxurious comfort that they have come to expect and enjoy on Crystal Cruises." Crystal Cruises is the world's leading luxury cruise provider, having earned more "World's Best" awards than any other cruise line, hotel, or resort in history. Aboard the all-inclusive, ultra-luxurious Crystal Symphony and Crystal Serenity, refined elegance meets casual simplicity. With an emphasis on innovative product differentiation, the renowned Crystal experience is distinguished by classic service, abundant space, superior quality and extensive choices. Crystal sails to all seven continents, providing worldwide vacations of five to 100+ days that bridge the best of land and sea.